Heres a superb online slots casino from Bally Wulff. This is a magical game set in woodland and featuring a wizard. It also packs a powerful delivery with loads of bonus features, giving you a lot to get to grips with. With breathtaking graphics and so much depth, this slot games will keep you coming back for more for quite some time. Founded in 1950 and based in Berlin, German gaming developer, Bally Wulff, has been part of the Schmidt Group since 2007. Forward thinking and with a focus on the leisure industry, the company invests in fitness as well as physical gaming centres throughout Germany but its online games are in use worldwide. If you love promo's, get the best slots promotions today. 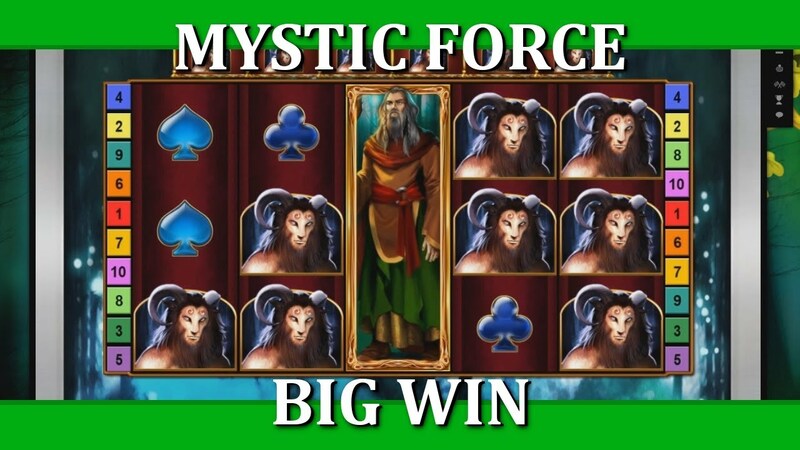 The Mystic Force online slots casino game has a 5 reel, 3 line and 10 payline format. The aim is to spin the reels, and produce winning combos, triggering bonus features as you go. Click ? for information on how to play or click Paytable to look at the winning combinations. Place your bet using the + and – symbols up to the max or use Max Bet to take you there quicker. Select your paylines, using the + and – symbols. You can set up the game to autoplay selecting a number up to 100 or play manually spin by spin. Click Autostart or Spin and away you go. There are the usual playing cards, lowest in value along with herbs, mushrooms, a bird, a lynx, a deer and a half-man half-beast symbol (the top-paying symbol). If you see 3, 4 or 5 of him you can win 10, 25 or 50 times your bet. In addition there are the wilds and scatters. WIZARD –replaces all the other symbols except the scatter. The wizard has a magic staff which can trigger other card symbols to upgrade e.g. herbs become mushrooms etc, making your potential winnings greater. And each time he appears in free spins he gives another free spin. ANTLERS WITH EAGLE – if you spin 3, 4 or 5 of this symbol you’ll get 12 free spins. Triggered by spinning 3, 4 or 5 scatters, you get 12 free spins and if you spin the wizard on any of these freebies he’ll give you another free spin. He’ll also upgrade the symbol cards potentially earning you more. CARD GAMBLE – you choose whether the next card drawn is red or black and if you’re right you double your winnings. LADDER GAMBLE – you click Gamble to keep playing and each time you win you step up the ladder towards the jackpot. 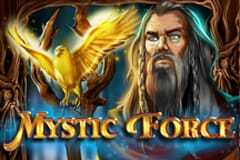 The Mystic Force online slots game is a visual dream with an otherworldly soundtrack which starts off slow but really steps up in the free spins. 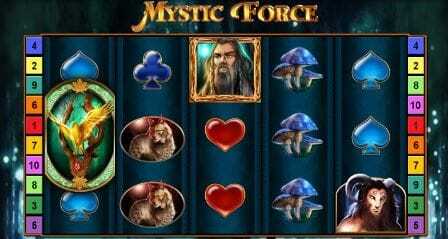 If you like it, you’ll probably also like Bally Wulff’s Thor’s Hammer online slots.